Ng et al. (126) has been recently retrospectively compared the outcomes of 100 transperitoneal and 63 retroperitoneal laparoscopic approach to partial nephrectomy for tumor. 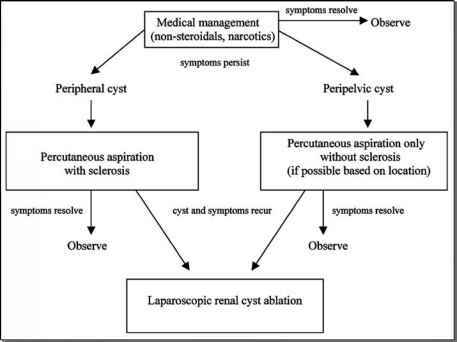 Choice of laparoscopic approach was dictated primarily by tumor location: transperitoneal laparoscopic partial nephrectomy for anterior or lateral lesions and retroperitoneal laparoscopic partial nephrectomy for posterior or posterolateral lesions. The approaches differed primarily by technique of hilar control since en bloc hilar control was achieved with a Satinsky clamp during transperitoneal laparoscopic partial nephrectomy, while during retroperitoneal laparoscopic partial nephrectomy individual control of renal artery and vein was obtained with two bulldog clamps. retroperitoneal laparoscopic partial nephrectomy was employed to manage 77% of posterior tumors, whereas 97% of anterior tumors were managed with transperitoneal laparoscopic partial nephrectomy. Transperitoneal laparoscopic partial nephrectomy was associated with significantly larger tumors (3.2 vs. 2.5 cm, p < 0.001), more calyceal suture repairs (79% vs. 57%; p = 0.004), longer ischemia time (31 vs. 28 minutes; p = 0.04), longer operative time (3.5 vs. 2.9 hours; p < 0.001), and longer hospital stay (2.9 vs. 2.2 days; p < 0.01) compared to retroperitoneal laparoscopic partial nephrectomy. Blood loss, perioperative complications, postoperative serum creatinine, analgesic requirements, and histologic outcomes were comparable between the groups. The authors concluded that limited retroperitoneal space makes retroperitoneal laparoscopic partial nephrectomy technically more challenging but provides superior access to posterior, particularly pos-teromedial, lesions. However, whenever feasible, they preferred the transperitoneal approach for laparoscopic partial nephrectomy because of its larger working area for intracorporeal renal reconstruction. Also, transperitoneal laparoscopic partial nephrec-tomy was the preferred approach for all anterior or lateral tumors, as well as large or deeply infiltrating posterior tumors that required substantive guillotine resection (heminephrectomy).